Doctors, from GPs to specialists to surgeons, have always played an important role in public health. Up until the last few decades of the twentieth century, doctors were recognized as key community members—sources of sage advice and wisdom that people would regularly seek out for a variety of health-related concerns and questions. Then came the Internet and, for better or for worse, an abundant new source of information that a large and growing number of patients have come to rely on it, to the point that more than half of US adults use the web as their first source for medical answers. That includes social media sites. Social media is changing things yet again. For a time, it seemed as though modern technology was causing communities to splinter apart. Now the pendulum is swinging back in the other direction. Over a third of US adults say they use social media to find trustworthy health information, and a whopping 90% of people ages 18-14 say they trust medical information shared by their social media peers. You might be rolling your eyes at the idea of memes becoming the new source of medical advice, but don’t give up on social media—-along with these modern challenges come some great opportunities. If you do social media right, and avoid some common missteps, you can build a healthier community and a stronger healthcare practice to boot. DO provide fun and interesting information. You want to be seen as a reliable information source, sure, but that doesn’t mean providing nothing but links to medical journal articles or lectures on healthy lifestyle habits. Use Twitter, Facebook, and other social media channels to share funny stories you come across (we probably don’t need to say it, but don’t go sharing your patients’ private experiences or information) and quick medical facts your patients might find surprising. Just like the advice you give in the office, the info you provide via social media is much more likely to be taken to heart if it’s presented in an engaging, patient-affirming way. Give them something to enjoy, and you can sneak the medical lessons in with greater ease and efficacy. DO use images in your posts. Content with relevant images see 94% more shares than similar content without images, and you’ll easily see double the engagement on Facebook for posts with images in your audience’s news feed. From the slightly macabre to the massively fun to just plain eye-catching, quality images are an essential part of ay medical office’s social media posts. DO engage with your patients/audience. Remember, social media is the new standard in community building. It’s not a one-way communication media, where you post things and get patients in your office as a result. Social media is all about interaction—when someone comments on one of your posts, or asks a question, or even lodges a public complaint, don’t just ignore it (and unless the complaint contains private information, don’t delete it). Respond in a positive, professional, and pleasant manner. Invite anyone with an issue to contact you privately, and for everyone else thank them for the insight, express appreciation for their attention, and answer their questions. If you can do all that each and every day, you’ll be ahead of nearly 90% of the competition. DON’T just talk about yourself/your practice. Everything you share vs social media should be relevant to your practice and your patients, but that doesn’t mean it all has to be about you—in fact, most of it shouldn’t be. If your Facebook page is nothing but calls for new patients, flu shot reminders, and office announcement, even your loyal patients will stop paying attention pretty quickly. Share useful information about health, your practice area, local events, and other goodies that people will enjoy even when they aren’t thinking about their personal healthcare. Reddit, a social media link-aggregating site and discussion community, sets a 9:1 ratio in their Reddiquette guide: for every 1 link to your own content/business, you should share 9 posts that don’t directly relate to your business at all. You can probably make that ratio a bit smaller on Facebook, Twitter, Instagram, and the rest, but the principle remains the same. DON’T limit yourself to your existing fans/followers. You’re not the only medical office in town, and you won’t lose patients by sharing things you see on other medical practices’ pages and feeds. Sharing other practices’ and professionals’ posts is actually a great way to encourage them to share yours and grow your social media reach. You can even reach out to other medical offices directly and inquire about co-marketing through shared social media posts. DON’T mix your personal and professional social media accounts. This is a carryover from keeping professional distance in the real world, and should be a no-brainer, but there’s always someone… Even if you’re not posting pictures of yourself getting plastered at that three-day “professional development seminar,” keeping your private life private is greatly preferred by patients and practitioners alike. Get your patients to be fans of your professional Facebook page. Don’t invite them to “friend” you on your personal account. You’ll be very happy to have that distinction in place the first time you meet a problem patient online, we promise. Keep these tips in mind, and your medical practice will be well on its way to social media success! For more insights into growing your practice through digital marketing, visit us at InboundMD. Garrett is the Founder, and Chief Marketer at InboundMD. Garrett has been successfully leading internet marketing campaigns for health care practices across the US for almost a decade. He's a frequent speaker at events, and author of "Book Now! 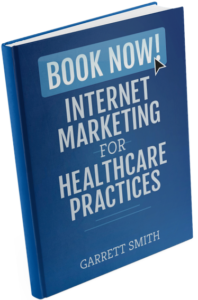 Internet Marketing for Healthcare Practices", and the host of The Practice Marketing Podcast that details how successful practices are winning online.